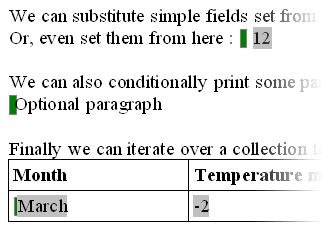 A powerfull templating facility is included in jOpenDocument. 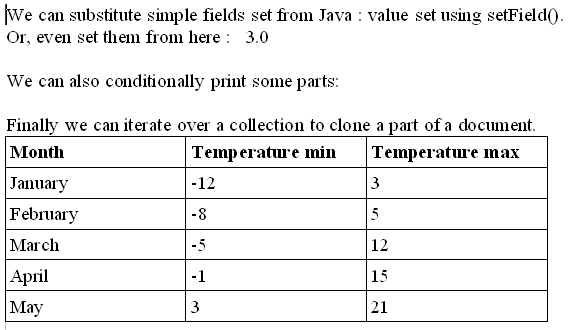 You start by creating a template file, directly in OpenOffice, with the help of the jOpenDocument AddOn. It lets you quickly insert all the grey and green spans you see below. // Fill with sample values. // Open the document with OpenOffice.org ! You start by creating a template. You can then define values that you need in you document. Either by using setField(), or by using showParagraph()/hideParagraph(). Finally you just call saveAs().